I nearly gave up on this maquette but then decided I could use it to experiment on at the same time as developing the full size one. I have made 3 coracle type shapes by inserting hoops. I have been experimenting with suitable fabrics to form the shell of the sculpture. 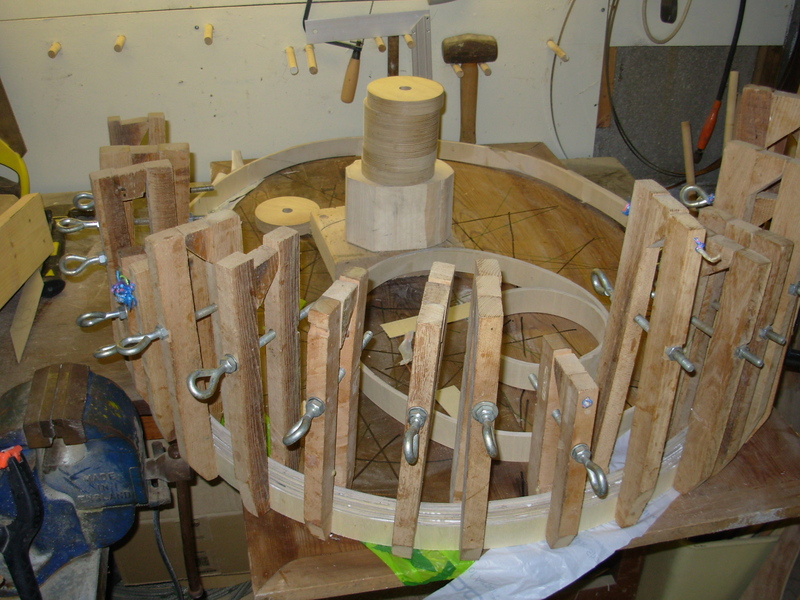 The picture shows a double skin of muslin glued to the rim. I then painted the skin with a dilute solution of PVA glue. This worked really well by shrinking the skin and reinforcing the fabric. It’s ready to paint a colour now if I want, but this is going to give me accessibility problems. Easy to paint the exterior but really difficult to paint the inside around those shaping hoops. I have devised a cunning plan to overcome all this in the full sized version! 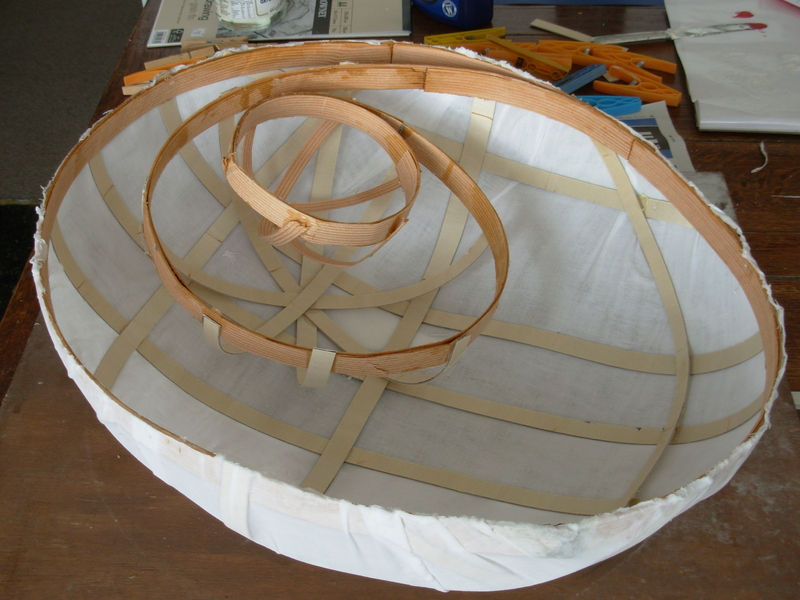 Beginning with the smallest inside dome: cover the frame tightly in dry double muslin. Paint my chosen colour over the outside so that it soaks through to the inside. When dry, paint a reinforcing layer of PVA over the outside. When dry, paint the different outside colour over the outside. I thought a really deep, dark blue! The work on the full size one is going well but slowly. 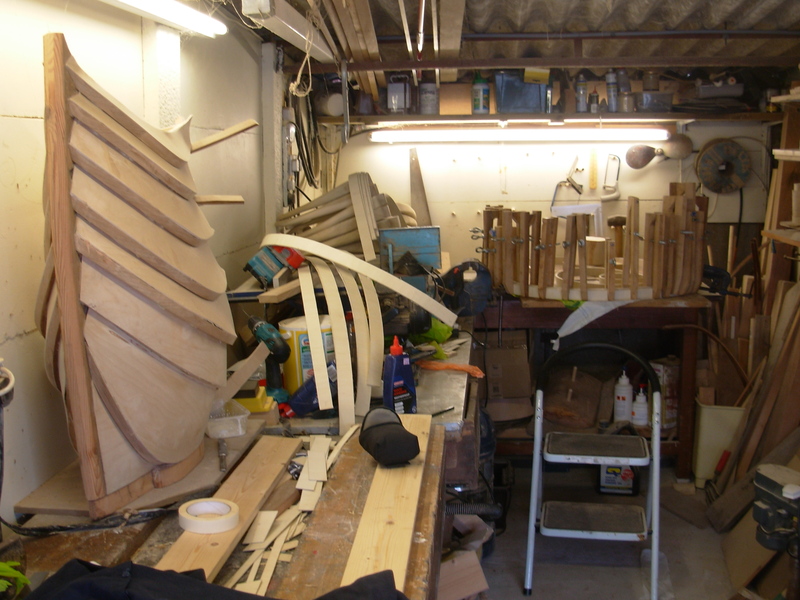 This is because I have decided to get the curves I want by laminating thin, bendy strips of 1.5 mm ply. 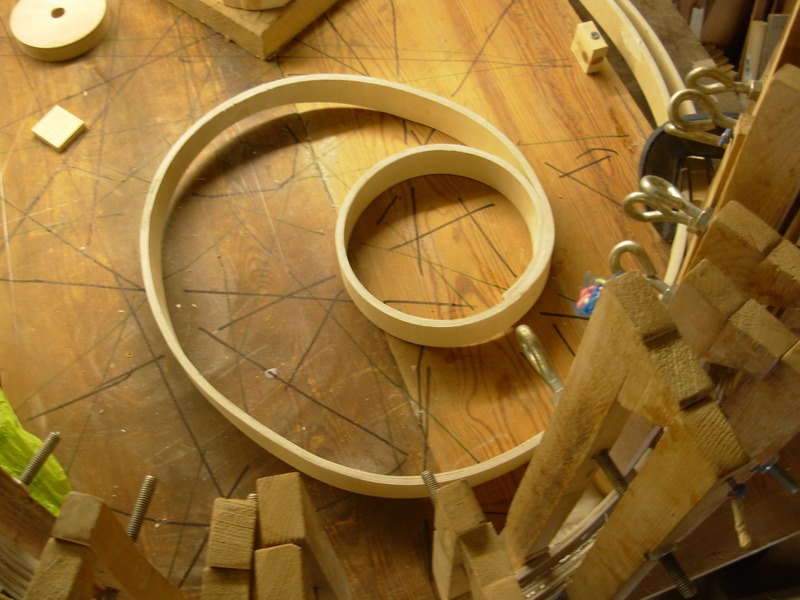 This curve is made with 4 separate strips glued together and formed into a spiral while the glue is wet. 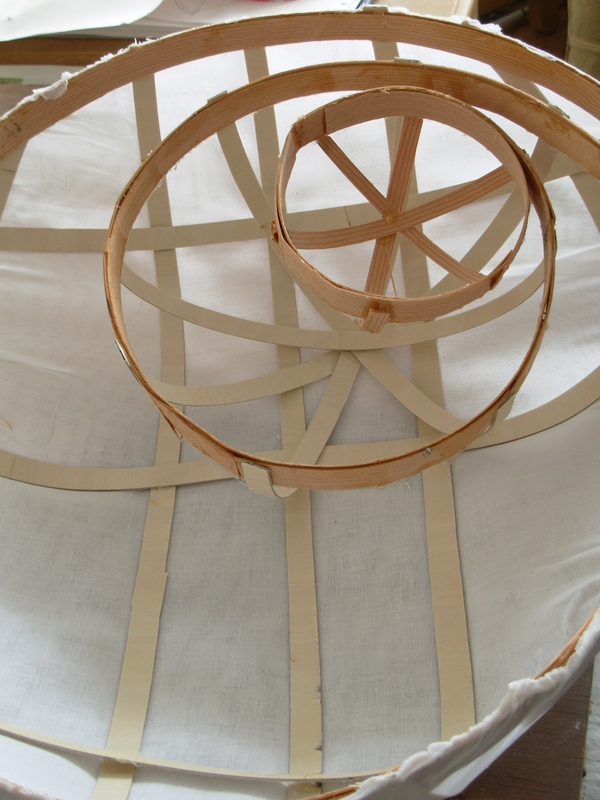 I have made the rim of the coracle/spiral and I’m now using it as a pattern to make the hoops. My homemade clamps have been invaluable for this operation. See some of the completed hoops in the middle of the photograph? I had a panic this morning. I have started to count the time left for this project, in weeks rather than months. The exhibition is early March and so I have calculated that I have 10 clear weeks left. That surely is not enough time. Four months sounds so much longer. I was hoping to produce 10 sculptures altogether with 3 already made before I started. Maybe it will be only 9. So many problems to solve. What am I going to call this current sculpture? Spiracle, Coracle Shell, Russian Coracles? I need some answers quick! I was wondering where you’d got too…a sudden dearth of posts! Looks good…a little like a coracle I think!